The American Geosciences Institute (AGI), in collaboration with many other geoscience societies, invites geoscientists to come to Washington D.C. for the annual Geosciences Congressional Visits Days (GEO-CVD) on September 12-13, 2018. Decision makers need to hear from geoscientists. Join us and many of your colleagues for this two-day event uniting geoscience researchers, professionals, students, educators, engineers, and executives in Washington D.C. to raise visibility and support for the geosciences! Celebrate National Fossil Day with the National Park Service. Click here to find National Fossil Day events near you. Millions of people will practice how to “Drop, Cover, and Hold On” earthquake drill Thursday, Oct. 18 at 10:18 a.m. during this important earthquake drill. Resister your school, business, family and participate. Learn about earthquake potential in Missouri. Watch award-winning videos made by Missouri school children about what to do before, during and after an earthquake. For the contests, entries may be submitted any time up to the Friday of Earth Science Week, October 19, 2018. These contests allow both students and the general public to participate in the celebration, learn about Earth science, and compete for prizes. To learn more about these contests, including how to enter, visit online. Learn about the study, uses, importance of geologic mapping for education, science, business, and a variety of public policy concerns. Special mapping exhibits will be on display at the Ed Clark Museum of Missouri Geology, 111 Fairgrounds Road in Rolla, Mo. Learn more about and download geologic maps. This hike, led by USGS geologist Pete Modreski, will be jointly held for members of the Florissant Scientific Society (FSS) and anyone from the public who wants to join us. The FSS is an informal group that holds monthly meetings or field trips, at varied locations anywhere in the Front Range area. All who wish to come on this hike are welcome to join us. It is not necessary to register in advance, but for questions or directions or uncertainty about the weather conditions on the 15th, please call or email Pete Modreski, cell 720-205-2553, email pmodreski@usgs.gov (weekdays) or pmodreski@aol.com (weekend). Each state geological survey may also be sponsoring events. Check their web sites for the latest information. The first Earth Science Week in Japan is planned to be held in Shizuoka from October 13 through 19 mainly at Museum of Natural and Environment History, Shizuoka. For further details, see the following URL or email esw.japan@gmail.com. 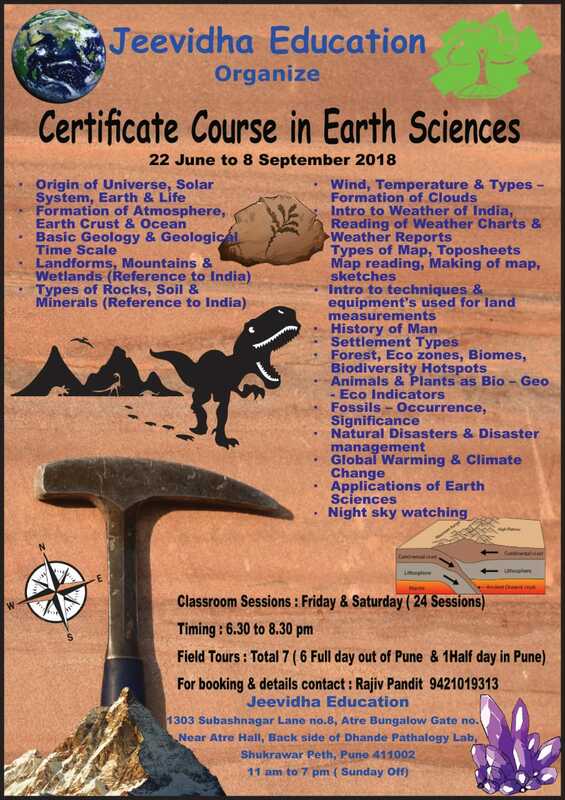 Jeevidha Certificate Course on "Earth Sciences"
A three mont certificate course on Earth science will be organized by Jeevidha, an NGO working in environment awareness and conservation, during all 24 classroom sessions on Fridays & Saturdays plus sevenfield visits on Sundays. This year Jeevidha alsp plans to conduct an exhibition on the topic "Man & Stone". For further details on the topics covered in this course, click here. May 22-23, 2019 in Rome, Italy. Is your organization participating in or supporting Earth Science Week? We would love to know what you are doing. Please contact us so that we may update our list.